Theatrical Creativity and Continuity in a Changing World. Hong Kong: Hong Kong University Press, 2010. 235 pp. As a performance-based theater, jingju (Beijing/Peking opera) has undergone tremendous changes over the past century in reaction to social and cultural transformations, including the modernist attacks in the Republican era, PRC dramatic reform campaign in the 1950s, formal and thematic strictures of the model plays both leading up to and during the Cultural Revolution (1966-1976), challenges by the market economy in the post-Mao era, and political whims under martial law (1949-1987) and after in Taiwan. 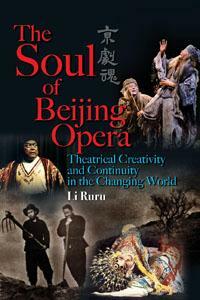 In The Soul of Beijing Opera: Theatrical Creativity and Continuity in the Changing World, Li Ruru argues that through these tumultuous times, it is the genre’s performers and “[t]heir response to the diverse and continuously changing demands of theatre and society [that] make jingju what it is and maintain it in a state of constant mutation” (275). The book focuses on six artists who represent jingju‘s four role types (hangdang)–sheng (male), dan (female), jing (painted face), and chou (clown); whose works span the early twentieth century to the present; and who were or still are active in three major centers of jingju: Beijing, Shanghai, and Taiwan. Thee artists under discussion are Cheng Yanqiu (1904-1958, male actor ofdan roles, Republican era, Beijing), Li Yuru (1924-2008, dan actress, pre-Cultural Revolution PRC, Shanghai), Ma Yongan (1942-2007, jing actor, Cultural Revolution model plays, Beijing), Yan Qinggu (1970-, chou actor, post-Mao, Shanghai), Kuo Hsiao-chuang (1951-, dan actress, 1970s to early 1990s, Taiwan), and Wu Hsing-kuo (1953-, sheng actor, 1980s to present, Taiwan). This is an ambitious book in its attempt to investigate critical changes in the past century of jingju history from the viewpoint of its star performers. Li is uniquely qualified to take on such a task, as the daughter of Li Yuru, one of the leading jingju actresses, a student of Cheng Yanqiu in his Beijing Theater School (1930-1941), and a top star of Shanghai Jingju Theatre where Yang Qinggu is the principal chou actor. Li Ruru is also one of the few scholars originally from China to have conducted in-depth research on jingju in Taiwan. More pertinent to this project, Li has recently completed three projects in Chinese concerning her mother’s life and art: a biography, an edited volume of her representative plays, and a collection of her writings that include some highly insightful reflections on the historical circumstances and performance details of her productions. At the core of Li’s project is an attempt to understand jingju‘s evolution from the actor’s perspective, both externally, how they adapted their art to meet the challenges of their times, and internally, how they reconciled their adaptation with their training, specifically in relation to the teachings of their masters, the specificities of their role types and performance styles (liupai), and their borrowing from other theatrical forms. Before the case studies, Li devotes two chapters to delineating the external transformation (Chapter 1: “Jingju: Formation, Growth and the First Reform”) and the performance and training basics that define ajingju actor (Chapter 2: “Training of a Total Performer: Four Skills and Five Canons”). This analytical pattern continues in each of six case study chapters, starting with the social, political, and artistic environment in which the actors find themselves, followed by discussions of how their training prepares them for these changes, and ending with their artistic and creative navigations between these internal and external demands. The final part of each case study is usually full of insightful revelations. In the case of Cheng Yanqiu in chapter 3, for example, Li Ruru starts with useful contextual information that includes debates on the maledan system, the Qing dynasty xianggong system in which male apprentices acted as courtesans, Cheng’s masculine personality in contradiction to his feminine roles, and his complicated relationship with his master and rival Mei Lanfang. The chapter then dives into the specifics of Cheng’s balance of yin and yang through a detailed analysis of one of Cheng’s arias and his complicated dance and “water sleeve” movements in the play Tears in the Barren Mountain (Huangshan lei). Here, Li Ruru draws attention to how Cheng’s masculinity is revealed through contrasting high and low notes that are slightly out of the normal range for dan singing; this singing technique allows the male actor to powerful embody the role of a heroine who suffers acutely under and oppressive taxation system. The final two chapters move to Taiwan, where jingju evolved on a separate path after 1949. Chapter 7 focuses on Kuo Hsiao-chuang, an actress who greatly modernized jingju performance and brought it to a young generation between the late 1970s and early 1990s, when she abruptly left the stage just as theatrical exchange with the mainland had recommenced. The final chapter brings us the current international sensation Wu Hsing-kuo, who broke both with his master and with the theatrical conventions of jingju performance in staging intercultural productions that mesh jingju with classical Western plays, including works of Shakespeare and Beckett. Li highlights the poignant moment when Wu severed ties with his master, who disapproved of Wu’s forays into contemporary dance. This severing eventually paved the way for Wu’s intercultural productions, but it also left deep psychological scars that Wu would tap into in his one-person adaptation of King Lear, known as Li Er is Here (2001). These and other revealing examples powerfully underscore Li’s argument of the performers’ role in sustaining jingju‘s vitality over the past century. To me, these are the most informative and persuasive sections of the book, which is why I sometimes find myself wishing for more space devoted to these powerful arguments and revelations and less to the background and context at the beginning of each of the case study chapters. For example, the first half of chapter 4 on Li Yuru is devoted to drama reform in the 1950s, with a couple more pages on the emergence of jingju actresses and Li Yuru’s training; only then does the chapter turn to Li’s two plays in the 1950s and 1960s. One of them, the traditional play The Drunken Imperial Concubine (Guifei zuijiu), represented Li’s maturity as an artist by successfully combining different performance styles, whereas the other, a newly-created historical play titled Tang Sai’er, failed miserably as a result of following Mao Zedong’s directive to eulogize a Ming dynasty heroine in a peasant rebellion. The side-by-side discussion of these two productions vividly exemplifies the promise and frustrations of Li Yuru’s generation of actors and actresses who, having studied and performed in the pre-1949 system, were largely deprived of their creativity at the critical moment when their own styles were ready to emerge. However, the discussion of these two plays constitutes less than half of the chapter. This is somewhat frustrating since Li Ruru obviously has access to materials that could have been utilized to build a stronger case. That said, given the complicated histories behind these stories and Li’s stated mission to examine the actors’ interaction with their times, I can well understand the emphasis on context before diving into the historical and performance specifics. In fact, coming from China as I do, I find the context sections in the two Taiwan chapters extremely helpful in understanding the performance choices Kuo and Wu made in reaction to the changing political and cultural circumstances under martial law and after. To me, this suggests that Li Ruru has struck the right balance between argument and context. Ultimately, The Soul of Beijing Opera offers an important contribution to our understanding of the role of jingju performers in the genre’s evolution over the past century. Its combination of sweeping scope and in-depth, at times very technical, analysis makes the book a must read in the study of Chinese theater.